The love affair continued when she subsequently fell in love with and married Tsoi’s bandmate Yuri Kasparyan. That woman was Joanna Stingray and she went on to play a major part in Russian music of the final years of the Soviet Union, and was also responsible for introducing Russian singers to the USA, via somewhat difficult means. 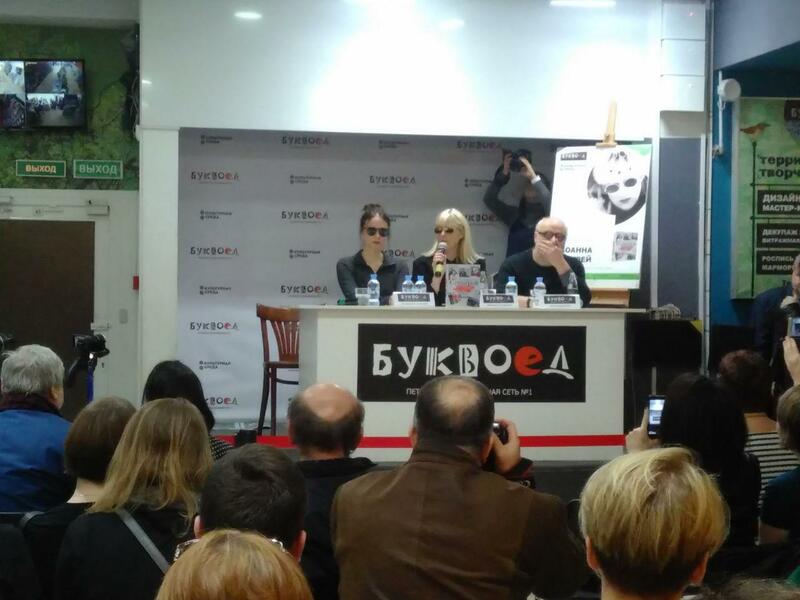 I’d read about Joanna when I read about Viktor Tsoi and so when I spotted an advertisement in a local bookstore announcing her arrival yesterday (Saturday) to publicise her new biography, complete with reminiscences of that time, I decided to turn up. 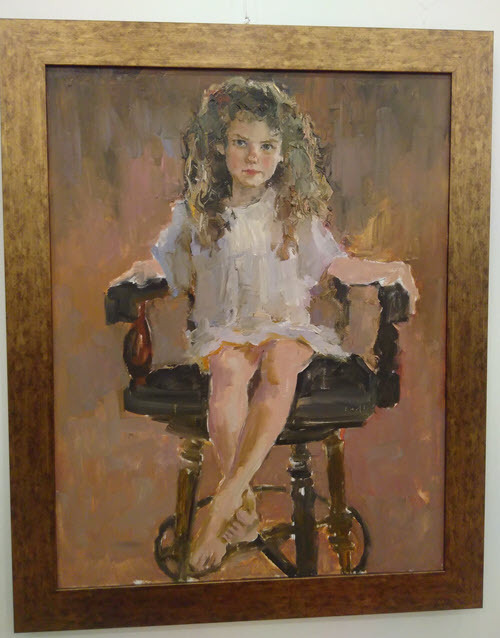 I wasn’t sure whether Joanna would be a half forgotten name from the past, with plenty of spare seats, or whether she still held cult status and people would be queuing up outside to catch a glimpse of her. Either way, I arrived 45 minutes before the start time of 12 midday, since I am that kind of person anyway! And when I arrived, there were only a couple of free seats left at the back. I was lucky. I got a seat. I estimated there were about a hundred chairs but by 12 midday there must have been at least another hundred people standing all around (Russian health and safety, anyone?) 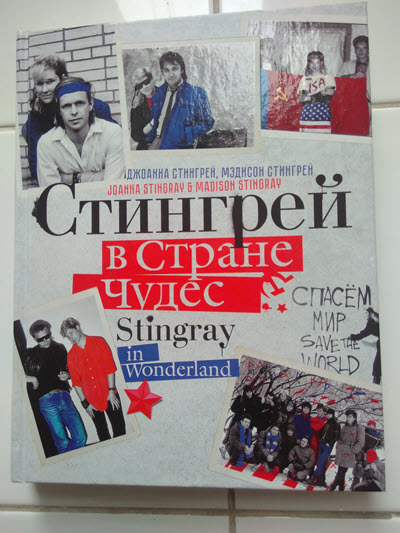 and I realised Joanna Stingray is still very much in the hearts of Russian people. She gave the whole interview in Russian -fluent Russian albeit full of grammatical errors – very much the kind of Russian you’d learn if you picked most of it up along the way. But hey, kudos to any American who learns/learned Russian, and it certainly allowed the audience to connect with her. They asked many questions about people of the time, about Tsoi, about communism… and many of her answers were met with applause, from people happy that someone at that time from ‘the West’ had shown an interest in and desire to promote their culture outside of the then Iron Curtain. It was interesting to note that a significant number of the audience would not have been born at the time Joanna, Viktor and other Russian singers and bands were around, and yet they still felt the need to come. Of course I bought the book! I’ve even started to read it – I can make out quite a bit of it, as it is written in the first person in a fairly conversational style. There is the added motivation that I am interested in the era so I actively want to understand it – always a boost. Here it is (Russian only) Стингрей в стране чудес – I got mine at a considerable discount as part of the event. Great photos, and apparently there are two more books on the way over the next couple of years. Today, Sunday, was a beautifully cold but sunny, blue-sky day in St Petersburg and I took myself off to Старая Деревня, north of the city (where, I only discovered later, Restoration and Storage centre of the Hermitage museum is open to the public) I was there to visit the northernmost Buddhist temple in Russia, built in 1915, officially recognised in 1989 and now very popular with tourists. It took me twenty minutes on the metro, changing once, and then under ten minutes to walk to the temple. It looks incongruous next to tall concrete skyscrapers with the noise of traffic from the main road, but when you enter the large gates you are in peaceful oasis. 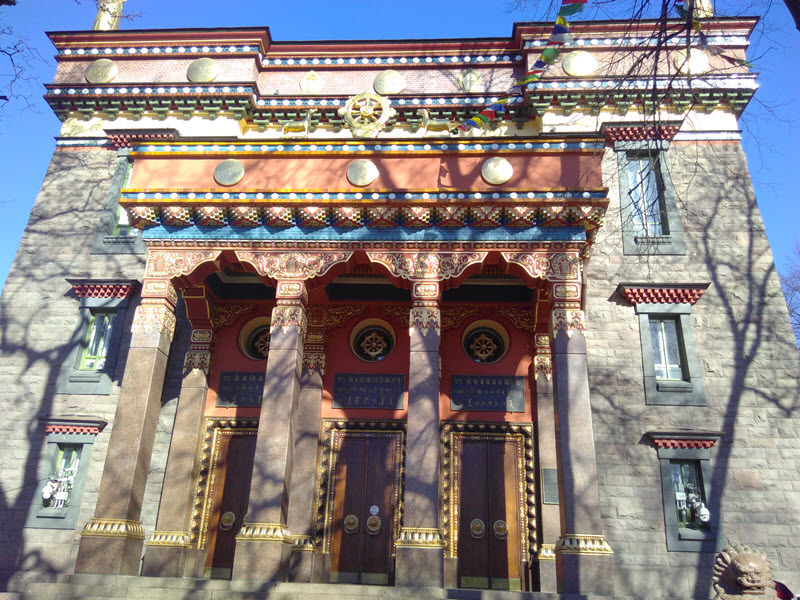 The temple is fronted by a garden with sculptures and spinning prayer wheels with benches to sit and relax. 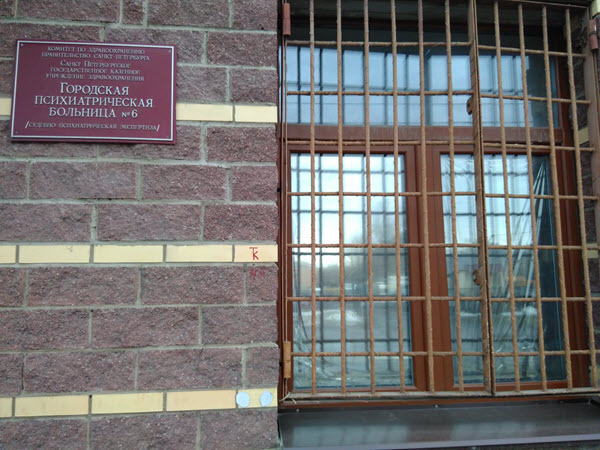 It’s free to go inside except for the five roubles for those ubiquitous blue plastic shoe covers, and you can visit the ornate prayer rooms and even go into the basement for cabbage soup in a little cafe. We met up at the metro station at Victory Park (Московский парк Победы), a park I highly recommend for a pleasant walk with history lessons thrown in. It is Lent – Great Lent or the Great Fast here in Russia and so (as a complete contrast from the wonderful but very rich food I experienced last weekend (blog post at your own peril) we had ‘vegan snacks’ which turned out to be marinated tofu, a kind of chickpea/pea puréé and fresh vegetables to add to Lavash bread (kind of like tortillas), mushrooms, fresh fruit and oh – lovely ginger tea. You don’t have to be religious to follow he Great Fast and I think there is certainly merit, health-wise, in restricting yourself periodically. We did a circular tour back to the metro to take in Park Aviatorov (aviators’ park) where there is an imposing fighter plane mounted on a concrete base. I , however, was in no fighting mood when I arrived with the son at the University on Friday morning to get my results. I was as nervous as before the exams themselves. I hoped and expected I would pass – it’s just you can never be certain until you see the actual grades on the paper. So here they are! Officious woman: There shouldn’t be any chairs in this corridor! What do you want a chair for anyway? Officious woman. Harumph! Well you had no right to do that. 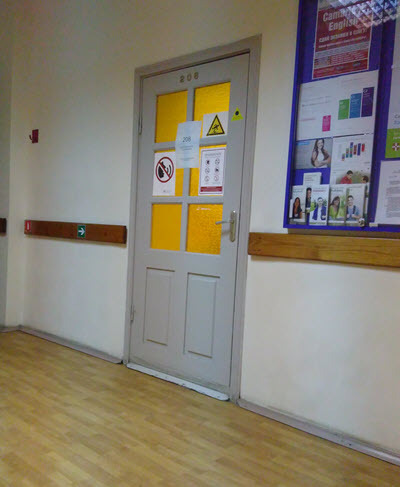 So I kept my chair and was just pondering on the bureaucratic nature of cleaning supervisors in Russia when the subordinate cleaning woman came back, winked and gave me the nod as if to say “Oh don’t bother about her -you sit on that chair if you want to” Then she asked me where I was from, what I was doing here, we had a chat and I realised: I didn’t need to pass this exam at all. I have already achieved what I set out to do, make myself understood in Russia in a natural way. My young Chinese co-examinees arrived and we were then taken into the exam room to do the Listening test. My big worry about this was that we could only hear the passages once. However, this was compensated for by the fact that we had plenty of time to read and digest the multiple choice questions, of which there were 30 and about six passages, dialogues and announcements. I felt very tense throughout, and was calculating the time in the test where, if I had got enough correct, I might pass. Somewhat of a shock was the fact that I was placed in front of a video camera. These exams, official exams, are recorded. I complained I hadn’t done my hair! I was quite nervous for the first few, unprepared questions but the examiner was very kind (I hope that’s not a trick) and we eventually got onto the girl/boy/dog story, which I had to summarise and give my own opinion of, and then we actually had a very interesting, natural conversation about languages, language learning at a senior age (he started learning Turkish at the age of 54) and the mental benefits of studying a new subject in later life. So I seriously hope I have passed after this. These last two weeks have been manic, trying to keep my head above water in a class a level above my own. My exam is B1 and I am in the B2 class, conscientiously spending hours doing the homework while at the same time continuing my work for Moodle. Study work eat sleep. Study work eat sleep. We then met the two grandmothers who also live with them and I had plenty of opportunity to practise speaking Russian. Champagne to celebrate the event, along with the seven year anniversary of my son having his first Russian lesson in London. All the food was homemade – from the borscht to the salad olivier to the blini to the gathered mushrooms preserved picked and tomatoes, pelmeni, fruit compote and finally a beautiful cream cake made by Lisa the fifteen year old daughter. And yes, I tried everything offered to me. Strangely, just after the cake and as I was drinking the green tea I suddenly became very hot – not just for a few seconds but for what seemed a longer time – and then the room seemed to go round and round and I suddenly realised I was going to faint. I had enough awareness to shout “I’m going to faint! Somebody help me” In English because I couldn’t remember the Russian -and my son was sitting next to me. The next thing I knew I was being tapped on the face by my son saying “Mum – are you going to come back to us?” And I felt a kind of regret because actually for the very few seconds I was actually ‘out’ I had felt a lovely calm, relaxing sleep… Then of course major panic ensued with the landlort, Sergei calling the paramedics and the mum taking my blood pressure…After feeling very hot and then cold and sick I was actually mostly ok by the time the paramedics came. That was an experience. I have never been visited upon my paramedics in England let alone Russia! There was a guy and a woman and they had a enormous bag of – well, what looked like lots of different phials of potions to me! They did my blood pressure (ok ) a fingerprick bloodtest (presumably ok because nobody said otherwise) and a cardiogram which was most interesting since I have never had one. I had to strip off, lie on the bed and have some monitors stuck to my chest and like a clip on each arm. Then some paper came out of a machine to the side of the bed. They both looked at it carefully and when I asked what it meant they didn’t say anything – which was a bit disturbing… They did talk when my son and the mum Olga came back in though. It was fine except for a “minor weakness” (we didn’t really understand what that meant) which might be nothing – I might have had it all my life without knowing – but which they recommended getting checked out by a cardiologist. They also recommended going to be checked out at hospital, but they weren’t too concerned when we turned that invitation down. Their general conclusion was that it was a ‘one off’ – maybe some food that disagreed, maybe over exertion – but they did advise going to a cardiologist. When they heard I would get it checked out in two weeks back in England they thought that was too long, so now, here I am, Saturday night, back in my own flat courtesy of Sergei, expecting a call from my son in the morning regarding a cardiologist appointment tomorrow evening (private, paying) He is working tomorrow until four and I have a nice invitation to lunch and a walk in the park, neither of which we feel the need to cancel, so it will have to be around sixish if available. How odd.I am not the fainting kind. I really am not. In months to come I will look upon this as one of the pivotal moments in my journey towards mastering the Russian language. Today however, I would just rather put it behind me. It has somewhat reminded me of my advancing age and my mortality…. One day in and my brain is full… I wonder what the Russian for “I’ve bitten off more than I can chew” is? Having worked extra for Moodle on Sunday in order to take some time out registering at the school and doing the placement test on Monday, I duly turned up at 8.45, did the test and a small oral exam and was placed in a group with two Germans, a Korean, a Swiss, an American and an Italian. One of the things I’ve loved about the language school is the diversity of the cultures. The first session revised time prepositions and the second was conversational vocab related to nutrition and food preparation – making me acutely aware of how many verbs and kitchen words I have simply never learned. Too many, in fact to actively memorise – I mean – how often am I going to need снять пену с бульона ? 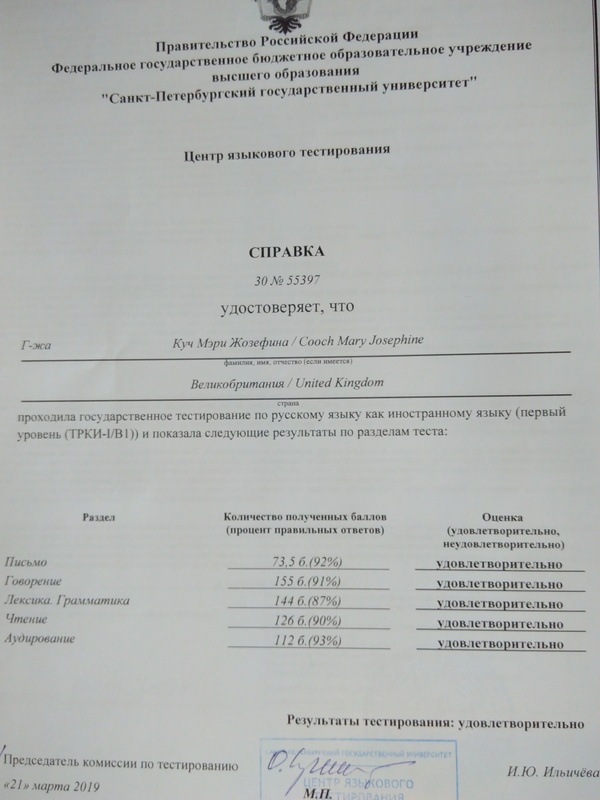 At two pm I went with my son or – as the Russians delightfully say “We with my son went” to the university to sign up for the exams. This is where it all went wrong. Fine for my son who is going to do the 3rd certificate (C1 level) in May but my carefully constructed plan of studying for three weeks and then in the final week of March taking the exam was abruptly destroyed when they said the room was full with a group of Chinese students and there was no availability. Could I do the week earlier -that is, 20th and 21st March? Well I could – I can – I don’t want to – but it was either that or not do the exam at all during this lengthy stay. So I booked it. Arrghhh. However, psychologically I then figured that if I don’t pass all the elements I can simply say both to myself and others “Well – I didn’t have enough time – I was’t ready”… and I can rebook for May, when my son does his. And it will also mean that the fourth week I am here, I can continue the Russian classes but just for the pleasure of learning, not with a significant goal in mind. I arrived without any hitches yesterday afternoon, Ist March. I am staying in a (now very ) familiar apartment on Nevsky Prospekt, almost palatial, and extremely convenient. The building is one of the very old ones with no lift but fortunately a young workman decided to show off his strength by carrying my 27kg suitcase up the four floors – who was I to protest? One thing I have noticed previously about Russia is that, when it is unbearably cold outside, they seem (to me) to make it unbearably warm inside! And not for the first time did I struggle last night trying to find the heating controls so I didn’t spend all night perspiring in bed. I usually end up opening a window, which then brings in very chilly air and is most environmentally unfriendly. Additionally, this morning I decided to figure out the oven. I can’t spend four weeks living off microwave or one ring hob meals; I want to stew, roast, bake. While the apartment itself is decorated in a beautiful 19th century style, the kitchen and bathroom are hi-tech, which meant the electric oven had an array of settings and a manual in Russian, Turkish, Polish and Slovenian… I never read manuals anyway, so by trial and error I managed to turn it on and set the correct temperature. Great. But then once I had decided my experiment was a success, it seemed impossible to turn it off. I turned the dials back to zero – waited for the fan to turn off and the oven to cool down – no chance. In despair I turned to the manual, deciphered the Russian, tried the suggested settings – still nothing doing. I had a very hot oven in a very hot apartment! After about an hour and a half, I gave up and went to the shops, resigned to contacting my host, Olga, for enlightenment. Lo and behold when I returned, the oven had finally switched itself off. While that does mean I won’t have to swelter any more, it also means I have no idea which of my attempts actually worked, so that when I do use the oven for real (“in anger” as Moodle developers say) I won’t be any the wiser how to turn it off!! My trip to the local supermarket, перекрёсток reminded me of the confusion I feel when trying to buy simple products in Russia such as milk or butter. I just wanted something to spread on my bread – but which butter should I get? 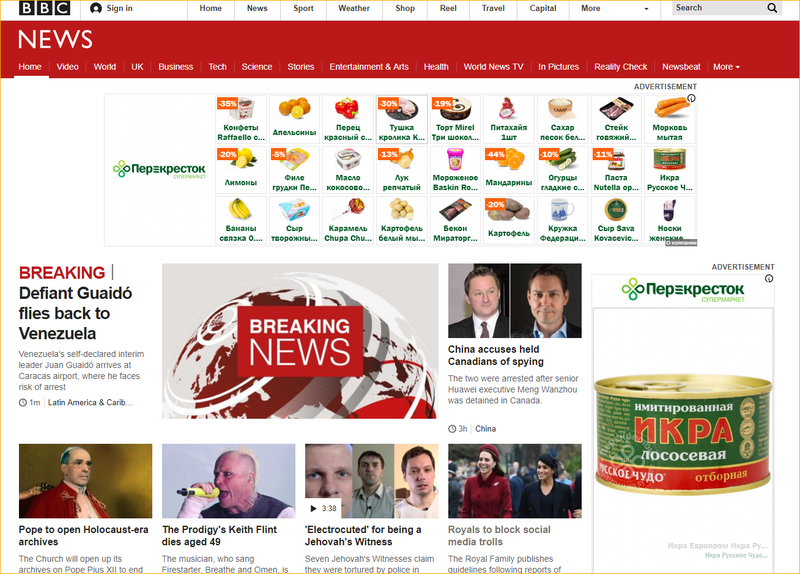 Is there no olive spread, which is what I buy at home? I spend ages looking and ultimately buy based on price, telling myself I am not fussy anyway fortunately. I have bought something spreadable in a tub, though what it consists of I have no real idea. Milk is the same but I am not over concerned as long as it has a picture of a cow on it. 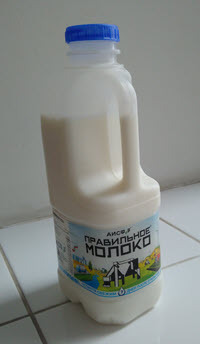 The one I chose called itself правильное молоко, which I interpreted as “correct milk” – so that must be the one!! !